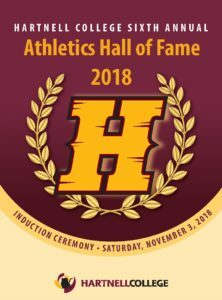 Hartnell Community College District is proud to announce the Athletics Hall of Fame Class of 2018 to be inducted on Saturday, November 3, 2018 at 411 Central Avenue in Salinas, California. This will be the sixth annual event. The festivities will start at 11:30 a.m. prior to the ceremony;we will offer a campus tour at 10:15 a.m. The ceremony and luncheon will include special presentations, the introduction of this year’s inductees, and much more. Following the induction Ceremony, this year, we will feature our second annual Hall of Fame Alumni Tailgate from 4:00 pm to 6:00 pm at The Salinas Storm House at 185 Maryal Dr. Salinas, California, (next to Rabobank Stadium). Lastly, in the evening, the inductees will be honored during halftime of that evening’s football game, Hartnell vs. Los Medanos at Rabobank Stadium in Salinas, kick-off will be at 6:00 pm. “It is truly an honor to welcome back and recognize those individuals and teams who have left their marks on Hartnell athletics during its extraordinary history of success,” said Superintendent/President, Dr. Willard Lewallen. After the luncheon and ceremony, a wall with the inductees’ plaques will be unveiled in the Gymnasium. Later that afternoon at 6:00 p.m., the inductees will be introduced during half-time at Rabobank Stadium where Hartnell Football will face Los Medanos College.